Please contact me via phone or email with any booking enquires or for a customised price quote. I will require credit card details to guarantee a booking. Payment is accepted in advance via bank transfer or on the day in cash. Cancellation at least 7 days in advance of booking is free, between 7 days and 48 hours will be charged at 50% and after 48 hours in advance of booking will be charged in full. 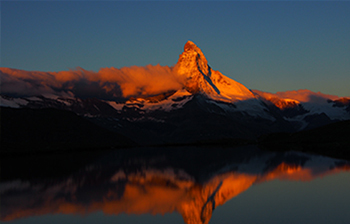 Participation in any activity organised or run by Fly Fish Zermatt is solely at the risk of the participant. Want to buy a special gift for someone or just enjoy being looked after for the day? Then the inclusive day tour is the one for you. The Inclusive Day allows you to fish alone with your guide or a group of friends, and provides you with everything you need on your trip. This privately owned lake will be yours for the day and every detail will be covered and included in the end fee. I will collect you from your accommodation in the morning, guide you throughout the day and return you happy to your accommodation later that evening. 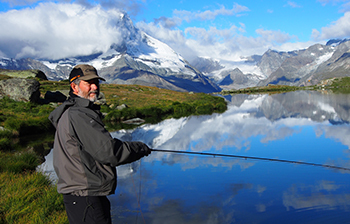 From Zermatt we travel up the mountain on the mountain lift system and then there is a scenic 15 min hike out to the lake where you can fish until your heart’s content. Lunch is at Fluhalp Restaurant, which overlooks the lake and where we can eat our catch of the day as part of their trout speciality set menu. How long you wish to linger over lunch is entirely up to you! We will be back in Zermatt by around 17:30. I encourage that every tour is tweaked and tailored to the person or group on the day. Timings are regularly altered to suit my clients’ wishes and changes in the weather.